This is a parallel post to Book Hype (for want of a better word), inspired by the entries to my recent Literary Lunch competition in which entrants had to name a book they’d really enjoyed this year. It could be any type of book, regardless of publication date. If a minimum of six people respond in the Comments to say they want to take part, I’ll do a post in the new year to share our thoughts. 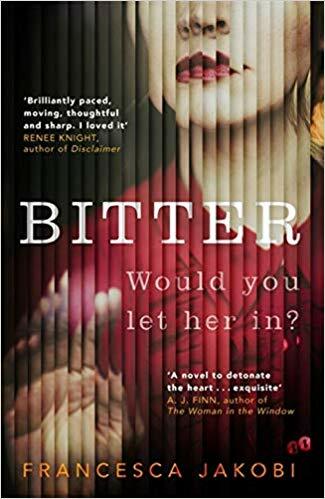 The book I’ve chosen, which speaks to my interests as a writer with its themes of mothers and daughters and the legacy of the past, is Bitter, the debut novel by Francesca Jakobi, as recommended by my friend (and discerning reader) Lucille Grant. How gorgeous is that cover? Whatever happens, I will report back on this one. Thanks again to everyone who entered and especially winner Zarina – we had a great Literary Lunch together. Interesting selection! I’m always up for reading books that I’ve never heard of, with the proviso that they need to be post-1945 (I know it’s a bit narrow minded, but I’ve never ever enjoyed any of the Victorian writers). So I’ve downloaded ‘Bitter’ to my Kindle (I’d prefer paper, but the price differential is huge). I’ve also downloaded ‘The Sisters of Stone’ because my own writing is exploring prose poetry/ short fiction and the fluid boundaries around these genres. Novels in a flash are on the edges of all this and I’m intrigued to read one.